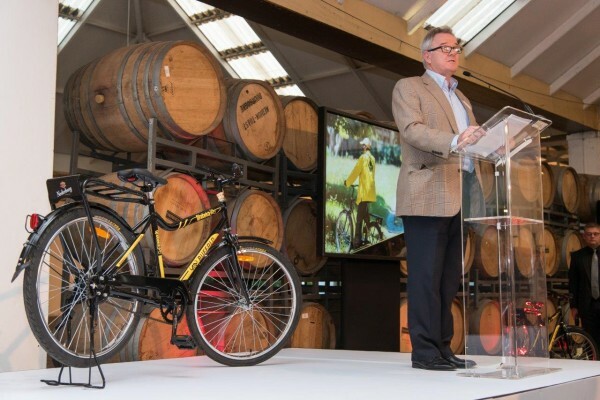 Nederburg, the exclusive premium wine partner of Team Dimension Data for Qhubeka, is working closely together with the non-profit organisation Qhubeka to establish their first bicycle assembly facility in the Western Cape, endorsed by the Western Cape Government. The facility was launched at a recent event held at Nederburg in Paarl, during the Team Dimension Data for Qhubekas training camp in Cape Town. Mr Alan Winde, Western Cape Minister of Economic Opportunities, addressed the audience at the event, and highlighted the provinces commitment to cycling as a sport to stimulate economic growth in the region. The Team Dimension Data for Qhubeka pro-cycling team, affectionately known as Africas Team, peddle for a cause. They raise funds and awareness for Qhubeka (which means to progress), the organisation that mobilises for socio-economic progress by distributing bicycles to needy South Africans in exchange for work done to improve the environment, community or academic results. Bikes let riders carry more books, more goods for sale, and more medicines and other supplies they can distribute amongst communities. Since its inception in 2005, Qhubeka has distributed bicycles to over 70 000 deserving South Africans. Qhubeka has an existing bicycle assembly facility located in the North West province of South Africa. The facility at the Nederburg winery in Paarl is the first in the Western Cape, and is expected to be in full operation by early February 2017. Eight women from the Paarl East community, which surrounds Nederburg, will be selected to work in and manage the facility. They will receive full training in assembling the bicycles. The majority of the bicycle parts, complying with Qhubekas specifications, are all of the highest quality and imported from the United States (US) and Asia, with some components made by manufacturers in South Africa. As a socially responsible entity, Nederburg is very focused on creating programmes where the whole is greater than the sum of its parts, says Dè-Mari Shaw, Nederburgs global general manager. The aim is to give back to communities as an investment in the future; in much the same way as Nederburg, in its own capacity, is upskilling talented South African wine-growers and winemakers. We believe that Nederburg is a South African brand that reflects the new dynamism of the country's wine industry, considered one of the most exciting New World wine producing countries by opinion leaders in the United Kingdom (UK) and the United States (US). The establishment of the bicycle facility at Nederburg forms an integral part of our commitment to continue building the future of the South African wine industry and its communities. Nederburg is also pledging to sponsor a minimum of 345 bicycles over the next year. The beneficiaries would include those from the Paarl East social development initiative, as well as projects such as the Wildlands Conservation Trust eco programme, and the Vision Afrika wood-work project. With so many lives to be changed, we encourage individuals to engage and participate in helping to make a difference to South African lives. Nederburg will be sharing the stories of those who benefit from receiving bicycles. Shaw concludes. For more information, visit www.nederburg.com/WhyWeRide, www.qhubeka.co.za and www.africasteam.com.